I’m not sure why we had been putting off traveling to Costa Rica for so long. They are close the US with cheap flights, the country is lush and green with amazing wildlife, and they have set a staple in the tourism for eco-tourism. When we arrived we were blown away by how beautiful the forest was and how at peace with nature we felt. Then we considered that the beaches are still world class with white sand beaches and turquoise water. It’s seriously the ultimate vacation package for families, friends, and honeymooners! Weather: There is a lot of weather going on in this tiny country. The rainy season typically runs from May to December. In the cloud forest, you can expect colder temperatures, while Guanacaste is typically dry and hot. The coastal areas are pretty much miserably hot and humid all year around. What to Pack: Good hiking shoes, a bathing suit, rain jacket, and rain boots. Stay Connected: We recommend Sim Cards from either Kolbi, Movistar, or Claro. Sim cards can be purchased in town centers. Large multi-bed dorms with 10 or more beds can start at around $5 depending on the season. However if you want fewer beds in the room or a private room expect to pay more. It’s standard for hostels to provide free (although maybe slow) WiFi, linens, and occasionally breakfast – many also have large common rooms, restaurants, and bars making it easy to meet people. We stayed a few Airbnb’s around Costa Rica. Airbnb gave us the chance to have our own apartment with a kitchen and do some cooking. Airbnb also gave us a chance to get away from resorts and live more like a local in a neighboring. There are literally hundreds (if not thousands) or Airbnb’s in Costa Rica. First time using Airbnb? Read our tips before booking! The Costa Rican government has taken active measures to protect the countries biodiversity. This means many lodges around the country are considered environmentally friendly with a promise to give back to the environment. You’ll find them all over the country and the range in price point and luxuriousness. Eco-lodges often include guides, tours, and food in their packages. In Spanish “casita” means “little house.” You’ll find this word and the little houses all over the country. We stayed in a few of these and loved our time in them as they were often very intimate and in secluded locations since they were small. You know those cool treehouses you see in Instagrams around the world? Well, I feel like Costa Rica is the birthplace of them. For sustainable, off-grid living, consider booking out a treehouse for a few days. 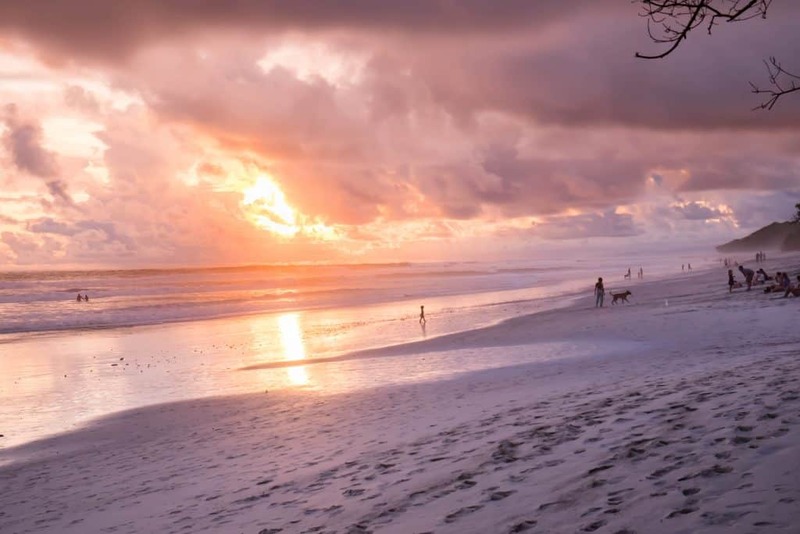 Read more of our favorite places to stay in Costa Rica. Costa Rica doesn’t have a huge public transport system. But there are local buses that you can get between most major destinations, towns, and cities. It can save a lot as car rentals can be expensive, though it will take some serious patience. Keep in mind that bus routes do not link destinations resulting in multiple transfers and a lot of wasted time in uncomfortable spaces. We rented a car for our three weeks in Costa Rica for under $500. 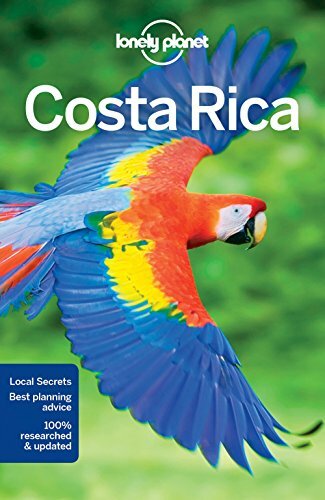 Keep in mind the destinations you plan to travel to Costa Rica as many roads are notoriously bad. Due to the poor roads, we rented a small 4×4 and would advise the same. While many of the main roads may be fine with a small car, it’s once you turn off that the need for a 4×4 is necessary. Another important thing to note is that in Costa Rica you are required to have third party liability insurance. This is not covered with your credit card or home insurance provider but check just in case you feel it may be covered. Due to the insurance, the price you see online is a lot more expensive than you may think, we suggest adding the insurance on to your booking to ensure you aren’t met with a surprise cost addition when you land in Costa Rica. It’s also possible to rent campervans in Costa Rica to explore and sleep in throughout your trip. We actually found food to be the worst value in Costa Rica. With plenty of sunshine and rich soil the country produces a lot of products; however, much of it is invaluable tropical fruits for export. This resulted in Costa Rica importing much of its produce to curtail this the government implemented tariffs on imported produce. The cheapest meals you can find out will be at soda shops. Check out to see where the locals are heading for the best ones. You can generally eat a full meal at a soda shop for $5-$10. Modern chain grocery stores can be found in major cities like San Jose and Jaco. You will be able to find most of the things you will need to cook a full and complete meal at these stores. However, outside of major cities, you will likely only find small convenience stores with limited items at a high price. Go searching for the Resplendent Quetzal in the cloud forests. The stunning Resplendent Quetzal is like the leopard in Africa. If you spot one consider yourself very very lucky. This beautiful bird is part of the trogon family and can be seen in the Costa Rica cloud forest. Grab some binoculars and a birding app and get to it! The Osa Peninsula in southwest Costa Rica has been named one of the most biodiverse places on earth. 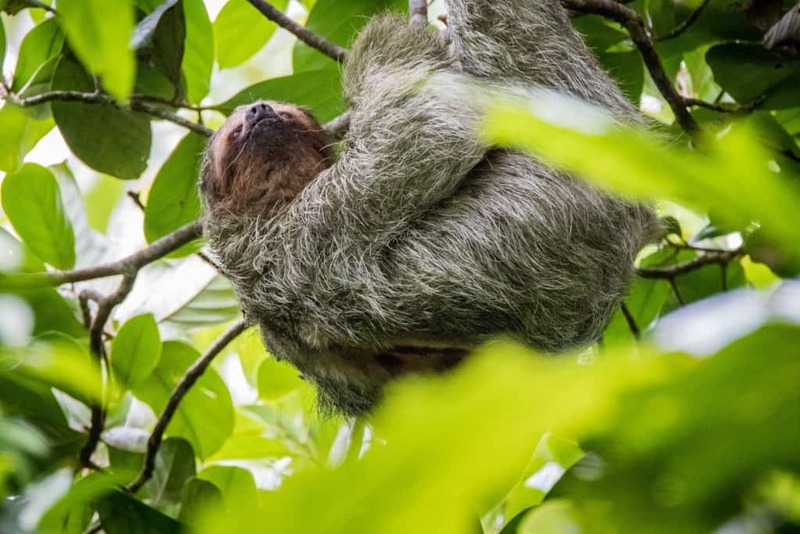 It’s home to at least half of all species living in Costa Rica, which is a lot considering Costa Rica is responsible for 4% of the total species estimated worldwide. The Osa Peninsula is where Corcovado National Park. It is Corcovado National Park where you see an abundance of wildlife. We personally saw 13 macaws within our first hour. Santa Teresa is located in Guanacaste, but in the far southwest of the peninsula where rain is abundant. Here you’ll find a buffer of rainforest along the coast where the ocean dumps large amounts of rain. It’s hip, eclectic and full of yoga studios and eco-lodges. Everything here still operates off one dirt road and isn’t completely easy to get to. It’s also one of the top places in the country to head for surfing. Experts and pros love it here as the breaks are intense; However there are still plenty of gentle areas for beginners. 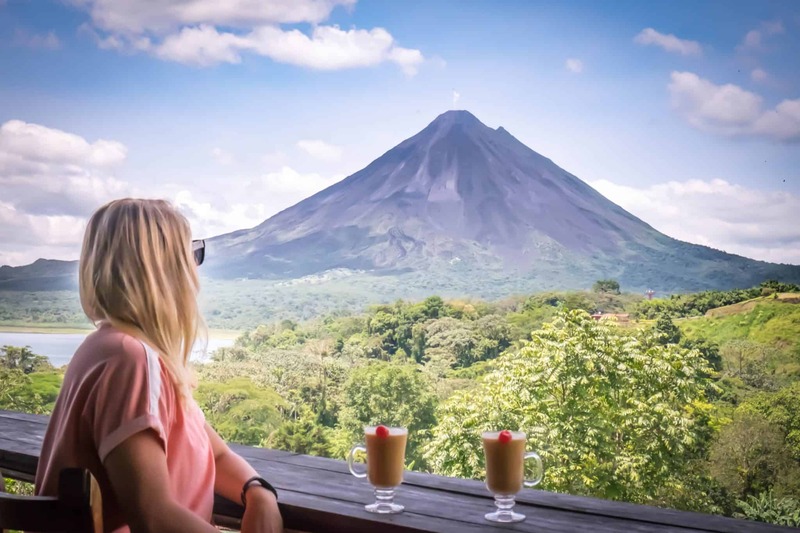 Close your eyes and picture a volcano in your head…what you likely envisioned is Arenal Volcano. The volcano is a perfectly formed cone volcano and surrounded by a biodiverse national park that is home to toucans, sloths, and even pumas. There are plenty of adventure activities to be had in the La Fortuna/Arenal area such as horseback riding, ATV tours, and zip lining. After the end of the action-packed day, you can head to any number of the hot springs in the area. 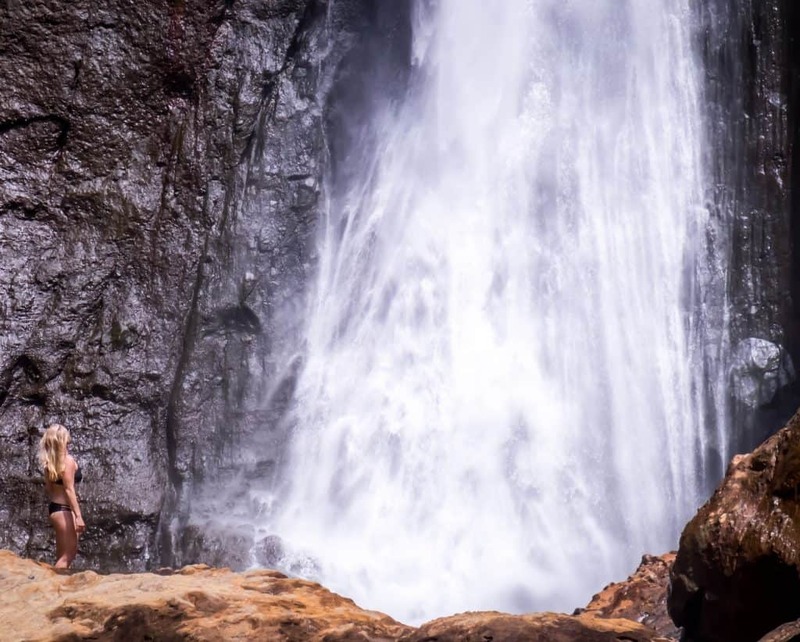 There must be hundreds of waterfalls all over Costa Rica just begging to be explored. A few of our favorites were Rio Celeste and Catarata Del Toro. La Paz, La Fortuna, Nauyaca, and Bijagual are also some very popular ones to visit. However, there are waterfalls all over that are not documented or on the tourist paths. So keep your eyes open while hiking. There are a few places in the world that known for their yogi scene (hello Bali and Northern India) and Costa Rica is one of them. Many resorts and lodges will offer yoga classes, and there are yoga studios around the country to go check out and practice out. If you want to practice yoga in Costa Rica consider bringing a travel yoga mat with you! Manual Antonio National Park is arguably the most popular and well-known park in the country. Although it is small it packs a whole lot of punch with 109 species of mammals and 184 birds. You also stand a very good chance of seeing a sloth here if that is your goal. Manuel Antonio is also home to a beautiful coastline with pretty white sand and amazing blue water. Once you arrive in Costa Rica you will quickly realize one of the most popular things to do there is go ziplining. If you are up for a high adventure through the forest then you should try ziplining. 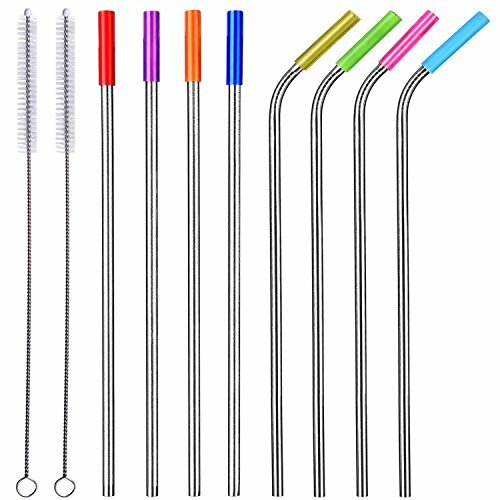 It’s great for families with children!